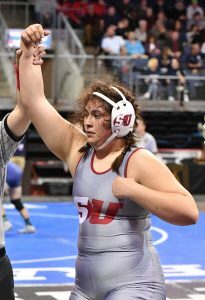 Freshman Alyssa Alvarez of Schreiner University sacrificed for her team at this past weekend’s NCWA National Championships by bumping up to the women’s 235-pound weight class, and it paid dividends for not just her team, but for her personally as well. Alvarez went on to win a National Championship, and, in the process, secured her team’s second-place finish in the tournament. Heading into the tournament, Schreiner University Head Coach Troy Jewell knew the best way to the women’s team championship was via a strategy of strength in numbers. But with multiple wrestlers sitting out the tournament due to injury, Coach Jewell was forced to make adjustments to the lineup. Alvarez agreed to bump up a weight class to fill the spot at 235 pounds. But Alvarez weighed in at only 195 pounds. Said Alvarez: “I moved up a weight class so that our team would be able to get as many of the weight classes filled, but with a forty pound weight difference, it was very intimidating.” Incredibly, she went on to work her way through the tournament without allowing a single point to be scored against her. Alvarez and Castro hand-fought and battled for position throughout the first period, but finished the round with no score. Alvarez chose bottom to start the second period, and Castro eventually worked to put in a tough half-Nelson against her. “Defending it, I got really scared when she started to crank it even more and more, and I thought to myself that it could be over,” Alvarez said. But Castro’s pressure slipped high, and Alvarez was able to shuck her off for the two point reversal. Alvarez would not look back from there, as she dominated the third period with a quick takedown and ride-out against her opponent, drawing three stall calls for additional points. “Thank goodness I caught her running at me out of the corner of my eye,” joked Jewell.